During the Motorola Mobility event at CES 2011, CEO Sanjay Jha, announced an overpowered smart phone: the Motorola Atrix. For those not familiar, it sports a dual-core Nvidia Tegra 2 processor with GPU, 1 GB of RAM, a biometric fingerprint scanner, and 9 hours of talk time. In addition, the Atrix docs into a laptop for access to a large-screen optimized OS or into a HDTV dock for a media center interface. Our friends at Android And Me recently published a list of 7 reasons why the Atrix rocks. Unfortunately, I do not completely agree. While these features are absolutely irresistible for geeks, it is an almost guaranteed disaster for the average user. The Atrix ships and functions as a standalone device, but Motorola also offers two accessories: a laptop dock and a HDTV dock. Unlike a regular computer, the Atrix laptop dock lacks a CPU and storage. Instead, it sports a large battery pack, a full keyboard, a touchpad, stereo speakers, and a 11.6 inch display. It weighs just 2.4 pounds, but the additional batteries can keep the Atrix running for nearly eight hours according to Motorola. The HDTV dock has a HDMI output and USB ports for a keyboard and mouse. When docked, it offers users access to either the webtop or media center interface. Motorola even includes an infrared remote control with the dock to control media playback. Despite the docking accessory in use, all the processing, network connections, and data storage happens on the Atrix handheld. While the hardware specs of the Atrix are impressive alone, these two accessories truly highlight the full potential. Unfortunately, neither AT&T or Motorola bundle these along with the phone, which makes it unlikely that customers will go out of their way to make a separate purchase. While having the option to choose which accessories to buy is technically more freedom, much of the hardware and software on the Atrix will go unused without it. In addition, AT&T and Motorola have not disclosed the price. If the laptop dock is too expensive, it could begin entering the territory of a netbook, which would be a better investment since it is also a full dedicated computer. Also, while the idea of having a single device capable of doing anything is tempting, people will probably still want a dedicated Apple TV, Boxee, or Google TV for their HDTV. While Apple’s iOS is known for it’s extremely polished and intuitive interface, Android still struggles in this area. Fortunately, Google’s upcoming version 2.3 code-name “Gingerbread” OS adds some much-needed user experience refinements. However, it is too early for Motorola to introduce additional webtop software into the mix. The company was still deciding on the reliance of their custom Moto Blur overlay even when the Droid 2 was announced last year. While the technologically savvy will not mind, multiple interfaces for a single device adds complication. The Atrix has both a full Firefox and standard Android web browser. Motorola’s extra software keeps tabs synced between both. However, this can be confusing since webpages will render differently in each. Then there’s this question: will users need to close Firefox browser tabs in webtop to avoid battery drain or free up memory? 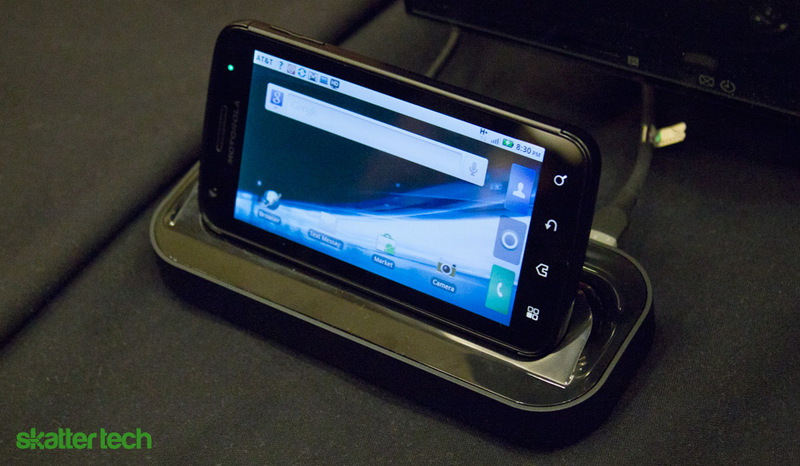 When in the laptop dock, Motorola lets users interact with Android through a window in webtop with a mouse and keyboard. Aside from accessibility reasons, offering two ways to interact with the same interface is confusing. Then there’s also the media center view for the HDTV dock, a third interface for the Atrix. Motorola lets users lean back and browse through their multimedia library with remote control. Although the software demoed was quite responsive and seemed polished, it’s hard to tell whether the final product will be as user-friendly and reliable. Let’s make one thing clear: I do not want to argue against innovation. This phone is undoubtedly powerful and unique. It has all the latest tech including a 4 inch qHD display, Android 2.2, WiFi, 5 person hotspot, Bluetooth, a 5 megapixel camera, a front-facing VGA camera for video chat, 16 GB of internal storage, microSD expansion, and much more. The Atrix definitely is a milestone of how far smart phones have come and how close they are to replacing low-powered computers. However, this is merely the first step. Those who buy one of these will be early adopters, meaning there is always a good chance that Motorola may scrap it, drop support, or release a next generation device that runs entirely different software. I think this is an interesting step into the future of mobile computing, but I also think Motorola needs to proceed cautiously. While Android is still maturing, it is to early to simply load a device with powerful hardware for the sole-sake of boasting hardware capabilities. This trend can be harmful and average customers will end up with overcomplicated and unreliable gadgets. That said, the Atrix is probably an amazing smart phone, but it will not replace a netbook or set-top box anytime soon. Whatever, this is the next step Apple did not see. Motorola is one up on us Apple users. My Ipad is far slower than my EEE pc , but I still like it. You have to be opened mined and give props when they deserve them. In the end this will make Apple step up which is a good thing. Apple I am sure will kill the Atrix if they decide to go the same way. Time will tell. I’ve wondered this for a while, when you say that Android OS’s struggle with being polished or intuitive what do you mean? I’ve never owned an iPhone, although I’ve used them quite a bit. I own a Droid Incredible, so I am using HTC Sense on top of Android OS. I’ve always found it pretty simple to use. If you are talking about bare Android OS, then I believe there are only two devices sporting that at this time, correct? Have you tried an Android phone that doesn’t have HTC Sense? I assure that you will be shocked. The basic interface is quite primitive. HTC Sense, Motorola Blur, and Samsung Touch Wiz add some much needed improvements for Eclair (2.1) and Froyo (2.2). Gingerbread adds plenty of refinements to make the interface more consistent and unified. There are many phones that have bare Android. Sprint alone has three: Samsung Transform, Sanyo ZIO, and LG Optimus. I am actually testing this Atrix phone right now… as an apple fan, I can definitely tell you all the neat features in this phone is what I have been seeking all these years. While the current model i have in my hand is locked from the android market place (for application testing), I can tell that the phone itself is very powerful. You wouldn’t happen to have a release date and price? the rumor is March 1st. Watch the Motorola website. They have pre-registration to be notified of when it will be in stock. The prices I’ve seen anywhere from 350 to 700 dollars. None of these is official however. There’s no way AT&T will charge that much for the phone. It will never sell if it is that expensive. That could possibly be the un subsidized price. The release date is March 3rd. I am wondering how you received the phone. I contacted the Business/Enterprise department at AT&T and they stated that they didn’t have any beta testing available. I think this debate between usability vs customizablity has been debated for years upon years. Why do some people get mac pc’s and some people get redhat linux? The power of Android is open source, that is the power of it. How many interfaces can you put on this new motorola? A lot. If you don’t like the way it looks, hey, go and download something new. You get four friends together with iphones and take all the phones and drop it into a pile, mix it all around, turn them all on, how long does it take for you to recognize which phone is yours? Pretty long time because they all look the same. But but but, that is because the interface is polished. Yay, I like looking like all of my friends. If your are pointing out that the iphone interface is more polished than the androids. It doesn’t take a genius to figure that one out. What impresses me about androids is that in 1 year since the iphone 4 has arrived. So many companies have released android phones that have made my AMD Athlon XP computer to shame. Now we have a dual core phone. Lg released a dual core phone too. the iphone 4, is still a 1ghz processor. When is the iphone 5 going to come out? The point I am trying to make is that we are finally at a point in time when the iphone 4 is losing ground on hardware performance. Iphone’s get released every 2 years. In two years, we have seen hardware growth that is substantially greater than what the iphone has given you. Ur exactly right! Also evan if iphone 5 has faster x2 CPU’s Apple still want be able to match the Tegra 2 GPU, it’s just to powerful…. Strange to argue that having the option to purchase accessories somehow makes this phone “not for everyone”. The phone is an awesome phone regardless of whether you choose to get the accessories. Yea, the processing capacity is cutting edge, but in a year, it will be typical. Do you seriously think the phone is too powerful? I guessni’s have to put that comment right up there with “no one will ever need more than 64 KB RAM. This phone is 2.5 x more MIPS than iPhone 4 or iPad. Yes, that’s a big jump, but it’s welcome! Let me clarify. I don’t think there should ever be a limit on overpowering a gadget. There’s always someone who wants to have the fastest gizmo (like me). However, my point of the article is to highlight the potential drawbacks. While have a dual core processor is pure awesome, if the software doesn’t take advantage of multi threading or the device is too expensive, then it is worthless for the average buyer. This might be too complicated for those who aren’t geeky and that buyers should recognize that they are early adopters. I’m confident that a future iteration of this device will (hopefully) be even more revolutionary. This is just the start of a lot more to come. Smart phones are truly beginning to pack the processing capabilities of netbooks from just a year or two ago. I hear this argument all the time… the software doesn’t take advantage of the processors. Well, when I buy a device like this I’m buy a two year product. Do you think there will be software that takes advantage of the dual cores within the next two years? Of course there will… so why is it a bad thing to buy hardware that will surely be used by software in the year or two that you’ll have the device? If you don’t know the answer already, then why would you bring it up? That is like saying, “Then there is this question: if you buy a different brand of milk, will the container leak?” What basis does the author have to ask such a question? Motorola says the thing will last x hours per charge… they didn’t say anything about browser tabs. And this entire article is like that in my opinion. The way this is written you’d think the author didn’t like when TVs came out with multiple inputs because *gasp* users must learn to switch from regular TV to their DVD player then to their game system – how confusing! Give people some credit here. I agree that Apple puts more thought into user experience than just about any other electronics designer; but if people can carry around the Atrix and use it as a phone one moment then connect it to a laptop dock the next, I bet they’ll figure it out. Using the media dock to connect directly to an HDTV is pretty slick, too. What are you talking about??? Everyone knows the new releases are not for the masses. You should try see the potential of this product. I think it is useless for a single person to own multiple devices like a smartphone, a laptop and another desktop. We should appreciate Moto for being the first to comeup with such a concept. One device for all our requirements, this is where the future is! I agree that this may not be the best device in its class and we have to wait until more such devices appear in the market. I still cant digest your topic as it is too negative kiddo. I think people are just mad that Apple didn’t come up with this first. Steve Jobs must be kicking himself for letting Motorola and Android get the best of him lol. Isn’t this the ultimate goal of technology in general? A phone is more powerful than city blocks worth of computers in the 70’s. Eventually, netbook technology will be none existent because everything you need will be in one single phone. I predict we’ll eventually see Apple come up with something just like this docking station in a few years. Apple will take full credit for it of course. Apple no way would make this. it is too many pieces. Really think apple would put a finger print reader into a phone anytime soon? But you are right, if they do it in the future, they will act like they were first. I remember people always saying OMG MacBook is first to have camera when Sony VAIO had it for ages before them. And they said same thing WOW MacBook has a backlit keyboard that is spaced out when Sony VAIO also had it for ages before they did. I’m not a fan of sony, just pointing out the truth. I have an iTouch but I’ll probably dump it for Galaxy S Player soon. First, the webtop is a strain of Linux that runs FireFox (I still don’t know why not Chrome but that’s another discussion). Apple isn’t putting Linux on their devies and other than iOS they don’t have another OS that would power the “webtop” portion, certainly not OSX. Second, if Apple did this the docks would be so expensive it would be pointless to buy any of them. I have just one thing to say, you don’t know what you are talking about. First, there is no such thing as too powerful. The battery life seems comparable (though spec’d less on standby time) to the iPhone 4 which has amazing battery life. So, now that two sources (Costco and Amazon) have leaked possible $150 price tags and the dock is rumored at $150, what exactly makes this “not for everybody”. Hey, if this phone were on Verizon, I would be running in line …. just what I am looking for ….. may even switch carriers to get it …. need to actually hold the Atrix, Thunderbolt, Bionic and iPhone 5 in my hand to make a final decision …..great competition …. Now, take away everything about the docks… And judge the phone in it’s own, because, you know, you don’t HAVE to buy the docks. Every negative thing you say in the article is due to the user having the “option” to purchase the docks. Since when is more options bad? Seems like core of Apple mentality. People switch from their phones to their computer all day long and no one is “confused” by that. And closing FireFox windows to save battery life???? The dock charges the phone, when you undock your battery has gotten better. Not to say I’m a fan if the dock but there are other more interesting things that could be brought up, besides that. Like why would I pay $500 for a dock when Google has it’s ChromeOS laptops coming down the pipe. Blazing fast boot times, super long battery life and everything synced to the cloud and therefore the phone as well, at what seems will be sub $200 prices. I mean, they’re giving away laptops to thousands of people, that has to go towards proof that these laptops can made super cheap. I’ll be trading up my iPhone 4 for an Atrix, AT&T can keep their docks though. Unless I can really get the multimedia dock from fommy.com for $80. This article was so bad that I just had to leave a comment – it had about 4 full original sentences, the rest are specs / reviews from other sites. The authors original thought? “the Atrix would be terrible if it used a GUI that it doesn’t currently use…” I am not sure if people really pay you to write this crap, but they really need to stop doing so. point 1: Additional Hardware Costs Extra. Have you seen the items being sold for iphones,ipods,ieverything? they all cost extra don’t they? from cases, to clips, to cables, to speakers and so on and so on. So based on this point, apple products would be the worst of the worst since so many additional items cost extra? i still never see why ppl compare iOS to Android and claim about lack of a seamless interface. I use a Motorola Milestone and find it just as intuitive and seamless as an iphone. I just got this phone a few days ago (on the day it was released). I have always thought the iphone was pretty cool, but I am boycotting Apple because I bought a $3,500 desktop from them, and it was complete garbage. I called tech support and they said they were aware of the problem but in 6 months Apple OS X would come out and solve the crashing. (yes it was years ago). So they knowing released crap on the market, charged tons of money for it, and did not support it. So with a deep hate towards Apple I was thinking about getting the Samsung Windows phone since it had a sweet LED display. Luckily before I ordered it I saw an ad on the AT&T website to preorder the Atrix. After a few micro seconds of research I was blown away. Now that it is in my hands I absolutely love it. I have used the iPhone 3g and 4, the LG Quantum (windows), and the Evo 4G (sprint)… and this phone is miles better. It’s an absolute joy to use. I rate it a 4.99 out of 5. Yes the iPhone has more Apps, and a lot of them are better than what you can get for the Androids. There is only 2 apps I wish I could get, so I can live with that. But when you factor in that I can get some apps not available to the iPhone it is even less of an issue. Lastly I hung up on 2 people when using as a traditional phone when my ear bumped the “end call” button on the screen accidently. So for those two reasons I had to knock .01 off my rating. I could write a novel of all the things this phone can do that an iPhone can’t. Obviously there is 4G and the laptop dock. Not to mention controlling HD output of your media to your TV with a remote control. But factoring that stuff out everyone one of my friends or family with the latest iphone was drooling with envy when they checked out the Atrix. I picked up one on release day. I gave my iPhone 4 to my son and now use the Atrix. Don’t regret it for a minute. You know what I found funny when I switched??? All the iPhone jailbreak apps were copying Android apps and functionality, how freaking hilarious. Only app I miss is something similar to HippoRemote, but I’m sure one will come along some day, I have three other iPhones in the house, and as everyone’s terms expire, they’ll be replaced with Android phones, and I’ll have more iPhones I can use for remotes. I thought I was going to miss NetFlix and Hulu, which I used lots, then I found tTorrent in the app store and arcMedia player to play the downloaded files and eztv.it to get the torrents. Now I don’t miss a thing, and the torrents get released earlier than Hulu Plus. Only gripe is that it takes a really long time, well, compared to the iPhone 4, for the batter to charge. It lasts just about as long as the iPhone 4 though, which was my favorite thing about that phone. I think I’ll get the external batter charger, under $20 and another battery, so I can charge one and use one. Because, you know, that’s possible with Android phones. oh noes, im not buying this phone but other which additional accesories are for free !!!!! Seriously, your bias is bleeding through the screen. All of the “issues” you have pointed out are not unique to this device or any. How many hundreds of EXTRA accessories does the iPhone platform have? How many of these are free? As far as Android being unpolished, all I can say to that is as a new user of Android OS I find it to be very intuitive and easy to use. To James: how can you say that jailbreak apps are copying android apps? Ignorance!!! Jailbreak apps have been developed since before android was even an idea. I have been using the atrix for two weeks and it irks me that the OS so underperforms the io. The atrix does not handle bluetooth controls like pause/play well at all. I must unselect and reselect bluetooth control with stitcher every time I use it. If a call comes in I press pause/play to answer and after the call ends, stitcher is not there and when I bring it baxk up, it starts again from the beginning, not cool when listening to a three hour podcast. If you have more than one media player, you can be listening to one and press pause, but then it starts another player, press pause again and you are back to player on, and player 3 starts. Why doesn’t android os better handle hardware access? When you press the menu button every app should have a quit option, and most do not.